Would you spend $100 to prevent a wrongful termination? Would you spend $100 to prevent a wrongful termination? As you may know, for over 30 years my law firm has defended auto dealers in wrongful termination cases. Ironically, I survived a wrongful termination of my own. I was issued a “termination notice” by a renowned cancer center. Rather incredibly, it turned out to be a misdiagnosis. 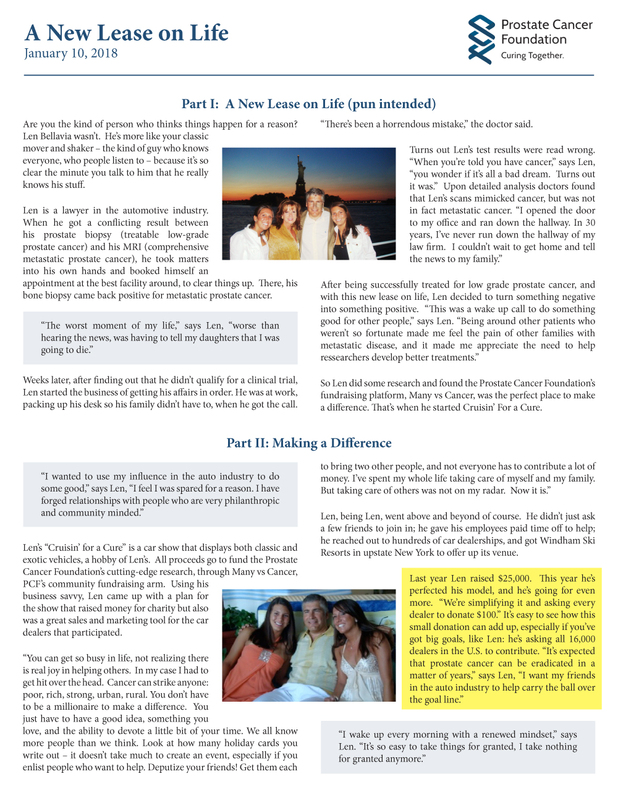 (See the enclosed story from the front page of the Prostate Cancer Foundation Newsletter). The threat was real for almost a month, until I was told of the mistake. No man should have to endure the anguish of terminal prostate cancer. So, I decided to transform my “new lease” on life into something meaningful for my male clients in the auto industry. To make a long story short, I have organized Dealers vs Cancer on behalf of the Prostate Cancer Foundation (PCF). I am asking all 16,000 franchised dealers in the US for a $100 donation. Just $100. It is expected that with adequate funding, medical researchers can cure prostate cancer within 5 years. By establishing Dealers vs Cancer, I committed to PCF that auto dealers would carry that ball over the goal line. I’m proud to have saved many dealerships from wrongful termination over the past 30 years, but now I’d like to save the dealer principals themselves. Your dealership’s contribution is vitally important. It will be presented to PCF at my annual Cruisin’ For The Cure classic car show this spring in Windham, NY. All contributing dealers will receive a “Dealers vs Cancer” Proclamation to be displayed in their showrooms. A sample is enclosed. Please send to me a $100 check per rooftop payable to “Dealers vs Cancer” in the next 30 days. I am truly grateful for your support. I will keep you updated. Download a PDF of this letter. Download a PDF of the “Dealers vs Cancer” Proclamation.